Atrioventricular Septal Defects (AVSD) account for 7.4% of Congenital Heart Defects (CHD). They may occur in isolation, with a narrow spectrum of age at presentation and prognosis, or in association with other intracardiac malformations: here symptoms and needs for treatment vary considerably. Moreover, their frequent association with abnormal genetic disorders, such as Trisomy 21 or Heterotaxy, further complicates the task of surgical treatment. Analysing the data is seemingly complex: some associations are exceedingly rare, while in other more common morphologies, the approach is variable and controversial. Although results have greatly improved in the last decades, early and late survival remains suboptimal, sometimes poor. Early mortality greatly varies, along with complexity of pathophysiology and repair, from 5% to over 30%. The dilemma between high operative risk and palliation of the univentricular type is at times daunting. The possibility of surgical cure is discussed according to surgical options but the frequent need for reintervention makes hope elusive. Late survival greatly differs, from 45% to 80% at 5-year follow-up. It is hardly surprising, in the western type of society, that prenatal diagnosis should result in a high rate of termination of pregnancy. This holds particularly true when a chromosomal abnormality is also identified. Atrioventricular Septal Defects (AVSD) represent 7.4% of congenital heart defects . Their morphologic features are usually classified as partial, intermediate and complete form in the partial form, a large defect of the Atrial Septum Primum (ASD) is present high above two separate atroventricular valves, the left one showing three leflets with a commissure pointing towards the inlet ventricular septum; in the intermediate form, besides the defects described above, a small portion of the inlet ventricular septum is absent (scooped-out) and this results in a small communication between the ventricles below the level of apposition of the avtrioventricular valves. In the complete form, a large portion of the inlet septum is scooped-out, allowing for a wide interventricular septal communication. Moreover, a single atrioventricular valve is present, guarding the common inlet to the ventricles. Well-known is the variable prevalence of associated trisomy 21 (Down Syndrome, DS), other genetic syndromes, such as Ellis –Van Crefeld, Holt Oram, Noonan, Smith-Lemli-Opitz, Van der Woude, Brachmann-de Lange, Goldenhar, Schizel-Giedion, Townes-Brocks and defect associations such as VACTERL and CHARGE (Figure 1) . 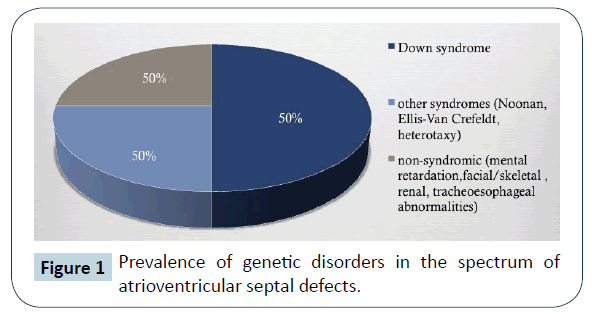 Figure 1: Prevalence of genetic disorders in the spectrum of atrioventricular septal defects. Surgical repair dates back to the early years of cardiac surgery and results have steadily improved. Atrioventricular septal defects in association with other intracardiac malformations (complex forms of AVSD) represent a much smaller percentage of live births, especially in older surgical series (Figure 2) ; their time of presentation, clinical status and possibility of surgical repair greatly differ and so does survival and quality of life. Rare occurrence combines with limited data in the medical literature. 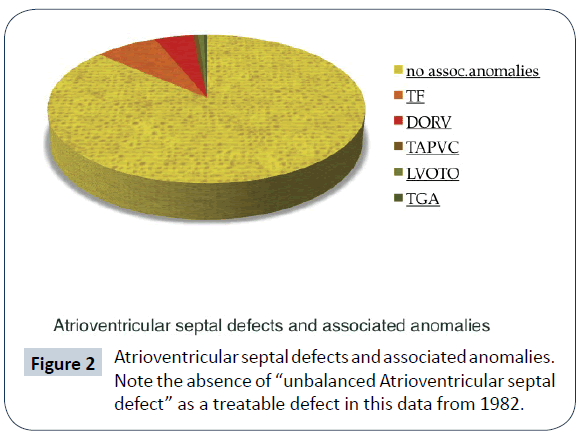 Figure 2: Atrioventricular septal defects and associated anomalies. Note the absence of “unbalanced Atrioventricular septal defect” as a treatable defect in this data from 1982. This rare anomaly (5-10% of all AVSD) is frequently associated with DS (60-90% of cases in surgical series). It is the most common cause of cyanosis in patients in the AVSD spectrum , due to an infundibular and/or pulmonary valve obstruction. The ventricular septal defect extends to the subaortic area. The AVSD is almost exclusively of the type C in Rastelli’s classification. A palliative procedure may be necessary in symptomatic neonates or small infants, in view of the complexity of complete repair; unfortunately, these procedures may result in increased dysfunction of the common AV valve and a high early mortality. Complete repair involves the placement of a large “comma-shaped” intraventricular patch through a transatrial-transpulmonary  or transatrial-transventricular surgical approach. Septation of the atria is usually performed by a second patch, but some surgeons favour a single-patch repair. In recent years, elective repair within the first year of life had been performed with a moderate operative risk (4- 9%) . Two-stage and single-stage repair were compared by Vitanova  and found to achieve similar results of survival at 10 years from repair (78% vs. 83%); freedom from reoperation for left AV valve regurgitation was also similar (73% vs. 71%). A moderate (or more) left AV valve regurgitation before repair was a risk factor for valve reintervention. Survival at 15 years from surgery varies from 70 to 90% in surgical series . Preservation of left AV valve function and right ventricular function are crucial in determining long-term morbidity and mortality. Incidence of reoperation, for repair or replacement of the left AV, valve varies from 5 to 30% . Longer follow-up intervals show a constant attrition rate in freedom from reoperation. Great emphasis is placed on the reduction of RV damage at repair [4,7]; transatrial/transpulmonary repair is widely favoured, with minimal transannular patch or a valve-sparing operation. The possibility of regurgitant pulmonary and tricuspid valves in association, is obviously highly detrimental. Sullivan  analysed a series of patients with Down Syndrome and ToF or AVSD/ToF, who required transannular patch repair [9,10]. They exhibited an earlier need for a Pulmonary Valve Replacement (PVR) than patients with normal chromosomes did; in a 59-months median followup interval, incidence of PVR was 34% vs. 18%, (p=0.03) respectively. A degree of pulmonary hypertension is presumed to be a contributory factor; in their series, PVR was more frequent in patients with AVSD/ToF than in those with isolated ToF (41 vs. 18%, p=0.02). This association represents only 5-8% of all AVSD. A large infundibular extension (subaortic or subpulmonary) of the ventricular component of the AVSD is present; the aorta is estimated to take origin from the right ventricle with more than 90% of its annulus (Figure 3). The pulmonary pathway may be obstructed. The AVSD morphology most often recalls type C of Rastelli classification, but the common valve may be anatomically bizarre; besides, either ventricular mass may be underdeveloped. The genetic asset of these patients is often normal: association with DS is exceedingly rare, while the most common genetic anomaly is that of heterotaxy syndrome . Early presentation often requires a palliative procedure, either a systemic to pulmonary shunt to relief deep cyanosis or pulmonary artery banding to reduce pulmonary overcirculation. Anatomical repair was reported anecdotically since the mid-seventies, sometimes requiring a double-patch ventricular septation. Recently, larger series appeared in the literature. Analysis of these results is complicated by two factors: 1) some series include patients with AVSD/DORV or ToF; 2) other series report different approaches, such as anatomic repair (biventricular) and Fontan-type palliation/repair. Good results (no early mortality) with anatomic repair were reported in 16 selected AVSD/DORV patients by Devaney . Ong  described a mixed population of 44 patients (22 with DORV) with early mortality of 8.3%; In the followup period, there were several reoperations, most of which were due to left AV valve dysfunction. By the Kaplan- Meier method, survival was 76% at 10 years, with 55% freedom from reoperation at same interval. In another mixed series , two-ventricle repair was possible in 35 patients, while 38 received a Fontan-type repair. Early mortality was similar (31% vs. 34%). The Kaplan-Meier survival at 5 years was 77% and 79%, respectively, and freedom from reintervention 85% and 91%. A repair performed before 1990 and a significant preoperative common AV valve insufficiency were univariate risk factors for death at surgery. In a selected series of 83 patients , only 8 of whom received a two-ventricle repair, 5-year survival was 81%. Neonatal presentation, associated heterotaxy (in particular Total Anomalous Pulmonary Venous Connection [TAPVC]) and severe preoperative common AV valve insufficiency were significant risk factors for early death. The considerable variability of anatomic features in this group of patients certainly calls for an age-dependent, individualised approach and for a careful evaluation of different strategies. Reinterventions, inherent to the malformation (a common AV valve) and to surgical choices (use of right ventricle–to-pulmonary artery [RV-PA] valved conduits.) must be anticipated. 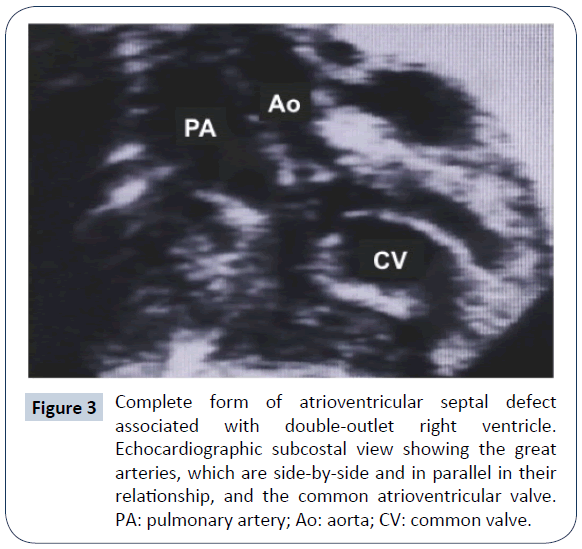 Figure 3: Complete form of atrioventricular septal defect associated with double-outlet right ventricle. Echocardiographic subcostal view showing the great arteries, which are side-by-side and in parallel in their relationship, and the common atrioventricular valve. PA: pulmonary artery; Ao: aorta; CV: common valve. This exceptional association has been mostly reported in pathology specimens. Two cases, successfully repaired, date back to 1994  and 1997 . Repair involved atrial and ventricular septation, division of pulmonary artery stump from the ascending aorta and placement of a RV-PA conduit. In the second case, TAPVC was present and required repair. In both cases, a trifoliate morphology the left AV valve was maintained. These patients were operated on at 18 days and 8 months of age respectively and will require reoperation(s) to replace their first conduit. Two further patients, one of whom with prenatal diagnosis , were associated with Down’s syndrome and heterotaxy  and were not treated surgically. A recent report  describes two cases of associated TA with AVSD and left ventricular hypoplasia. This complicated anomaly required a real surgical tour-de-force, starting with bilateral pulmonary artery banding and a second stage with division of the common trunk, debanding, extensive pulmonary artery reconstruction and bidirectional cavopulmonary anastomosis (BCPA). Both patients did well and await completion of this Single-Ventricle (SV) palliation. Their ultimate outcome remains, nevertheless, uncertain. This association represents 2-3% of all AVSD. It may be complicated by subpulmonary obstruction (left ventricular obstruction). In the first reported repair, Gonzalez-Lavin  utilized a Fontan type repair (right atrial to pulmonary artery valved conduit) and atrial septation; the common AV valve was left intact. The second attempt  was a biventricular repair by a Mustard intra-atrial baffle, ventricular septation and a left ventricle (LV) to-PA valved conduit. Both patients survived. In the following surgical era, the arterial switch operation was employed, together with AVSD repair [21-24]. Some patients had been previously treated with a pulmonary artery banding; the association with heterotaxy (left isomerism) and complex venous return required an intraatrial baffle procedure as well . All these anecdotical reports did well at surgery. Complications related the chosen surgical strategy (Fontan repair, intraatrial baffles and arterial switch operation) may occur in the late postoperative period, but data is not available. The term “unbalanced AVSD” (10-25% of all AVSD cases) pertains to a cardiac morphology where one of the ventricles has a reduced inlet portion and cavity size; the other ventricle is then termed “dominant”. Because a biventricular repair is the ideal solution for an AVSD, the definition of small ventricle (that is, unable to manage cardiac output) has been the source of considerable debate. Proposed metric parameters, calculated by echocardiography, include: atrioventricular valve index  (AVVI), right ventricular/left ventricular inflow angle , left ventricular inflow index  (LVII) and indexed ventricular septal defect . Staged surgery aiming at promoting ventricular growth, by increasing blood flow through the hypoplastic valve, has also been proposed . Nevertheless, borderline patients are encountered, and this may explain why the treatment of this condition remained challenging for decades and contemporary results, although improved, are still suboptimal. AVSD with left ventricular (LV) dominance is very uncommon and has a strong correlation to DS (Figures 4 and 5). Other genetic anomalies are very rare. In a multi-institutional study of 305 infants with AVSD , left dominance was found in 8, on the basis of AVVI. Six had biventricular repair with 1 death, and 2 had intermediate surgery, with 1 death. Strategies to counteract right ventricular (RV) hypoplasia were a calibrated residual ASD or a bidirectional cavopulmonary anastomosis. De Oliveira  reported that in 38 patients, 32 underwent biventricular repair; AVVI and RV/LV length ratio were employed in the surgical decision making. There were 3 deaths (9%) in this group and 1 (17%) in the single ventricle (SV) palliation group. Two patients in the biventricular group were reoperated on to create an ASD and survived. The conclusion of this work is that an attempt at biventricular repair, with creation of an adjustable ASD is justifiable. The authors feel that SV palliation in presence of DS is hazardous, because of inherent (even mildly) elevated pulmonary vascular resistance and respiratory problems. A recent report  described a successful biventricular repair after biventricular palliation (residual ASD or bidirectional cavopulmonary anastomosis). 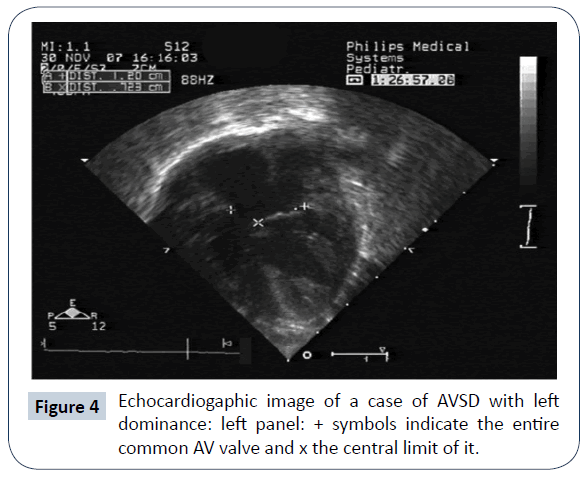 Figure 4: Echocardiogaphic image of a case of AVSD with left dominance: left panel: + symbols indicate the entire common AV valve and x the central limit of it. Figure 5: AVSD with left dominance: the right component of the common AV valve is interposed between the x and pointed square symbols. Note the extreme reduction of right ventricular chamber. AVSD with right ventricular (RV) dominance is more frequently encountered (Figures 6 and 7): there were 50 patients in the previously mentioned multi-institutional study . 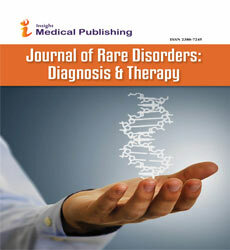 Various genetic assets have been reported, including normal kariotype, DS, heterotaxy and others syndromes. As the hypoplasia concerns the systemic ventricle, the identification of cutpoints with the available diagnostic methods is of uppermost relevance. A value of AVVI ≤ 0.67, RV/LV inflow angle (systolic) ≤ 114°, combined AVVI>0.41 with LVII <0.55 were considered to indicate/ predict SV Palliation . Nevertheless, common AV valve flow direction , a significant AV valve regurgitation and presence of a large ventricular septal defect  are believed to also influence the decision making process. In five reported series [25-27,30,33] biventricular repair was deemed possible in 86 patients, but 16 did not survive (19% mortality); 108 underwent SV staged palliation, with 40 deaths (mortality =37%). The subsequent course, in both groups, was complicated by the need of reoperation, usually due to left/common AV valve dysfunction. Limited information is available on medium-term survival; in Arunamata’s  series, the seven-year survival in the whole group was 76%. Owens  reported an overall survival of 44% at 5 years of follow-up. In these patients, SV palliation appears to carry a worse prognosis than in cases with Hypoplastic left heart syndrome, probably due to the frequent malfunction of the common AV valve. While conversion from a failing biventricular repair to SV palliation is likely doomed to fail , the opposite pathway has been explored in recent years: conversion from SV palliation to biventricular repair . In an initial series of 16 symptomatic patients at different stages of SV palliation, conversion to biventricular repair was considered, on the basis of echocardiographic 2-D and 3-D evaluation and MRI measurement of ventricular volumes. There was one early and one late death; 8 patients required reoperation. Most of these patients had genetic abnormalities (DS, heterotaxy) that are deemed at high risk for SV palliation. Additional data from the same group  suggested a lower incidence of need for heart transplantation and for catheter-based reinterventions with conversion to biventricular repair (complete or staged) than with SV palliation. Herrin reported that hemodynamic data  are extremely relevant in predicting an adverse outcome when a conversion approach is adopted. This strategy has raised a considerable debate [38-40]. A recent analysis of SV palliation for unbalanced AVSD reported a 25-year survival lower than 60%, still better than previously thought . Reoperation for AV valve dysfunction remains a common plague in any conceivable strategy for these patients. 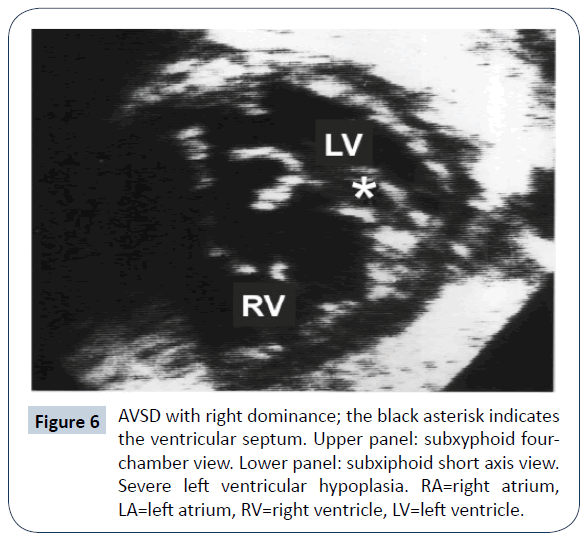 Figure 6: AVSD with right dominance; the black asterisk indicates the ventricular septum. Upper panel: subxyphoid four-chamber view. Lower panel: subxiphoid short axis view. Severe left ventricular hypoplasia. RA=right atrium, LA=left atrium, RV=right ventricle, LV=left ventricle. 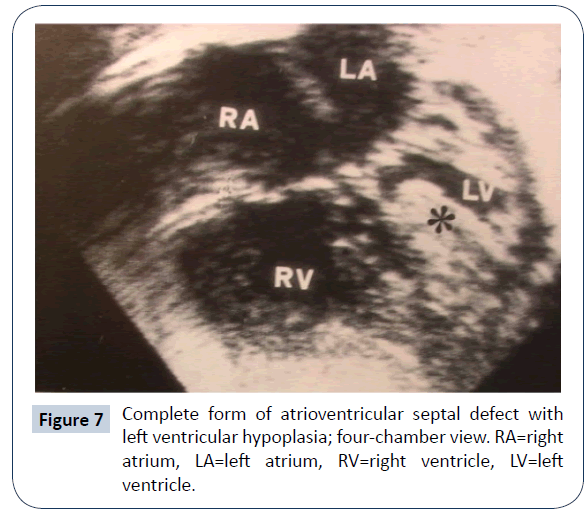 Figure 7: Complete form of atrioventricular septal defect with left ventricular hypoplasia; four-chamber view. RA=right atrium, LA=left atrium, RV=right ventricle, LV=left ventricle. Persons with Down Syndrome have multiple problems besides the high prevalence of CHD. Respiratory illnesses are very common in children with DS under the age of 3 years (Watts). Upper airways problems (macroglossia, laryngolamalacia, choanal stenosis, tracheomalacia, subglottic stenosis) may be present and, in combination with hypotonia, cause obstructive sleep apnoea (OSA). Recurrent episodes of silent aspiration may increase the incidence of respiratory tract infections. All these anomalies and events negatively affect the indication for congenital heart surgery. In particular, the hazard of (even mildly) elevated pulmonary vascular resistance has been considered a contraindication to univentricular palliation or correction (Fontan-type) for patients with DS. This concept was re-evaluated in the last decade with better patient selection. Excellent survival at palliation has been achieved when pulmonary vascular resistance was low (<3 WUnits/m2) during the first year of life [42- 44]. Nonetheless, an attrition rate (death, unsuitability, failure) towards Fontan-type repair of 27.5% at 5 years was described in patients with unbalanced AVSD . A large study on congenital heart surgery for DS from Japan  showed that Fontan-type repair was rarely performed and found at high risk (12% early mortality). Reports on small series of patients often describe surprisingly conflicting results, a fact that confirms the important role of selection of low-risk candidates [47,48]. Experience with heart transplantation is similarly limited in patients with DS. Ethical reasons and organ access limitations have been implied. Isolated reports of successful heart trasplantation in patients with DS and cardiomyopathy have appeared in the literature in the last decade [49,50]. In a nationwide US database, 64 patients (2.1%) with chromosomal abnormalities had heart transplantation , only 5 of whom had DS. In a group of patients of extreme anatomic severity such as unbalanced AVSD, it is likely that the option of heart transplantation for a DS patient will have to be considered. In complex forms of AVSD, the extent of repair is challenging and may result in reduced survival in comparison to isolated forms. Besides, probability of cure is very low. Ingenious surgical strategies have been developed, in order to reduce need for reinvention(s) and late mortality. The common AV valve, inherently abnormal, still represents the major source of late reintervention and mortality. SV type of palliation carries a global risk which is considered by some authors higher than with Hypoplastic Left Heart Syndrome. Prenatal diagnosis is now a standard of care. The association of DS with a complex malformation, for which treatment offers limited results, may weigh on the individual parental choice of termination of pregnancy. In the western-type society, this trend is indicated by the reduction of live-born children with the complete form of isolated AVSD, a defect which implies a very low surgical risk. Complex forms of AVSD may undoubtedly follow in this path [52,53]. The authors gratefully acknowledge the precious editing work of Ms. Vanessa Di Carlo, MA. Digilio MC, Marino B, Toscano A, Giannotti A, Dellapiccola B, et al. (1999) Atrioventricular Canal Defect Without Down Syndrome: A Heterogeneous Malformation. Am J Med Genetics 85: 140-146. Studer M, Blackstone EH, Kirklin JW, Pacifico AD, Soto B, et al. (1982) Determinants of early and late results of repair of atrioventricular septal (canal) defects. J Thorac Cardiovasc Surg 84: 523-542. Prifti E (2017) Repair of complete atrioventricular septal defect with tetralogy of Fallot Transl Pediatr 5: 1-7. Hoohenkerk GJ, Schoof PH, Bruggemans EF, Rijlaarsdam M, Hazekamp MG, et al. (2008) 28 years' experience with transatrial-transpulmonary repair of atrioventricular septal defect with tetralogy of Fallot. Ann Thorac Surg 85: 1686-1689. Vitanova K, Cleuziou J, Schreiber C, Günther T, Hörer J, et al. (2017) Long-Term Outcome of Patients With Complete Atrioventricular Septal Defect Combined With the Tetralogy of Fallot: Staged Repair Is Not Inferior to Primary Repair. Ann Thorac Surg 103: 876-880. Ong J, Brizard CP, d’Udekem Y, Weintraub R, Robertson T, et al. (2012) Repair of atrioventricular septal defect associated with tetralogy of Fallot or double–outlet right ventricle: 30 years of experience. Ann Thorac Surg 94: 172-178. Stephens EH, Ting J, Najjar M, Yilmaz B, Levasseur S, et al. (2017) Cardiac Function After Tetralogy of Fallot/Complete Atrioventricular Canal Repair. World J Pediatr Congenit Heart Surg 8: 189-195. Sullivan RT, Frommelt PC, Hill GD (2017) Earlier Pulmonary Valve Replacement in Down Syndrome Patients Following Tetralogy of Fallot Repair. Pediatr Cardiol 38: 1251-1256. Shuhaiber JH, Robinson B, Gauvreau K, Breitbart R, Mayer JE, et al. (2012) Outcome after repair of atrioventricular septal defect with tetralogy of Fallot. J Thorac Cardiovasc Surg 143: 338-343. Brancaccio G, Michielon G, Filippelli S, Di Carlo D, Iorio FS, et al. (2009) Transannular patching is a valid alternative for tetralofy of Fallot and complete atrioventricular septal defect repair. J Thorac Cardiovasc Surg 137: 919-923. Takeuchi K, McGowan FX, Bacha EA, Mayer JE, Zurakowski D, et al. (2006) Analysis of Surgical Outcome in Complex Double-Outlet Right Ventricle With Heterotaxy Syndrome or Complete Atrioventricular Canal Defect 82: 146-152. Devaney EJ, Lee T, Gelehrter S, Hirsch JC, Ohye RG, et al. (2010) Biventricular Repair of Atrioventricular Septal Defect With Common Atrioventricular Valve and Double-Outlet Right Ventricle. Ann Thorac Surg 89: 537-543. Raju V, Burkhart HM, Rigelman Hedberg N, Eidem BW, Li Z, et al. (2013) Surgical Strategy for Atrioventricular Septal Defect and Tetralogy of Fallot or Double-Outlet Right Ventricle. Ann Thorac Surg 95: 2079-2085. Sousa-Uva M, Serraf A, Cloez JL, Lacour-Gayet F, Roux D, et al. (1994) Repair of truncus arteriosus and complete atrioventricular canal defect. J Thorac Cardiovasc Surg 108: 385-387. Conte S, Jensen T, Jacobsen JR, Joyce FS, Lauridsen P, et al. (1997) One-Stage Repair of Truncus Arteriosus, CAVC, and TAPVC. Ann Thorac Surg 63: 1781-1783. Arai H, Harada K, Tamura M, Okamura T, Takada G, et al. (1995) Polysplenia syndrome with common atrioventricular canal and persistent truncus arteriosus. Tohoku J Exp Med 177: 171-177. Chintala K, Gurczynski J, Aggarwal S (2007) Prenatal diagnosis of complete atrioventricular septal defect with truncus arteriosus. Prenat Diagn 27: 560-562. Panwar S, Bradley SM, Kavarana MN (2012) Truncus Arteriosus and unbalanced complete atrioventricular septal defect: pulmonary protection in the neonate. Ann Thorac Surg 94: e151-e153. Gonzalez-Lavin L, Blair TC, Chi S, Sparrow AW (1977) Orthoterminal correction of coexisting d-transposition of great arteries, subpulmonary stenosis and a complete form of atrioventricular canal. J Thorac Cardiovasc Surg 73: 694-698. Alfieri O, Plokker M (1982) Repair of common atrioventricular canal associated with transposition of the great arteries and left ventricular outflow obstruction. J Thorac Cardiovasc Surg 84: 872-875. Kumar N, Prabhaker G, Wilson N, Al Halees Z, Duran CMG, et al. (1992) Total correction of transposition of great arteries with atrioventricular septal defect. Ann Thorac Surg 54: 989-990. Roughneen P, Mahmoudian MH, Ott DA (1995) Concomitant repair of complete atrioventricular canal defect and transposition of the great arteries in an infant. Cardiovascular Surgery 3: 78-80. Sakamoto K, Galletti L, Touchot A, Piot JD, Bruniaux J, et al. (1998) Two-stage correction of transposition of great arteries with complete atrioventricular canal. Ann Thorac Surg 65: 250-252. Kikuchi S, Sato S, Yokozawa M (2006) Primary surgical correction of transposition of the great arteries and atrioventricular septal defect associated with left isomerism. Pediatr Cardiol 271: 124-127. Cohen MS, Jacobs ML, Weinberg PM, Rychik J (1996) Morphometric analysis of unbalanced common atrioventricular canal using two-dimensional echocardiography. J Am Coll Cardiol 28: 1017-1023. Arunamata A, Balasubramanian S, Mainwaring R, Maeda K, Tierney ESS, et al. (2017) Right-Dominant Unbalanced Atrioventricular Septal Defect: Echocardiography in Surgical Decision Making Right-Dominant. J Am Soc Echocardiogr 30: 216-226. Szwast AL, Marino BS, Rychik J, Gaynor JW, Spray TL, et al. (2011) Usefulness of Left Ventricular Inflow Index to Predict Successful Biventricular Repair in Right-Dominant Unbalanced Atrioventricular Canal. Am J Cardiol 107: 103-109. Lugones I, Biancolini MF, Biancolini JC, de Dios AMS, Lugones G, et al. (2017) Feasibility of biventricular repair in right dominant unbalanced atrioventricular septal defect: a new mchocardiographic metric to refine surgical decision-making. World J Ped Cong Heart Surg 8: 460-467. Foker JE, Berry JM, Harvey BA, Pyles LA (2012) Mitral and tricuspid valve repair and growth in unbalanced atrial ventricular canal defects. J Thorac Cardiovasc Surg 143: S29-S32. Jegatheeswaran A, Pizarro C, Caldarone CA, Cohen MS, Baffa JM, et al. (2010) Echocardiographic definition and surgical decision making in unbalanced atrioventricular septal defect. A Congenital Heart Surgeons’ Society multiinstitutional study. Circulation 122: S209-S215. De Oliveira NC, Sittiwangkul R, McCrindle BW, Dipchand A, Yun TJ, et al. (2005) Biventricular repair in children with complete atrioventricular septal defect and a small right ventricle: anatomic and surgical considerations. J Thorac Cardiovasc Surg 130: 250-257. Hoashi T, Kitano M, Kagisaki K, Ichikawa H (2017) Successful biventricular conversion late after primary one and one-half ventricle repair. Ann Thorac Surg 103: e447-e448. Owens GE, Gomez-Fifer C, Gelehrter S, Owens ST (2009) Outcomes for patients with unbalanced atrioventricular septal defects. Pediatr Cardiol 30: 431-435. Cohen MS, Spray TL (2005) Surgical management of unbalanced atrioventricular canal defect. Semin Thorac Cardiovasc Surg Pediatr Card Surg Annu 8: 135-144. Nathan M, Liu H, Pigula FA, Fynn-Thompson F, Emani S, et al. (2013) Biventricular conversion after single-ventricle palliation in unbalanced atrioventricular canal defects. Ann Thorac Surg 95: 2086-2095. Nathan M, Emani S, IJsselhof R, Liu H, Gauvreau K, et al. (2017) Mid-term outcomes in unbalanced complete atrioventricular septal defect: role of biventricular conversion from single-ventricle palliation. Eur J Cardiothorac Surg 52: 565-572. Herrin MA, Zurakowski D, Baird CW, Banka P, Esch JJ, et al. (2017) Hemodynamic parameters predict adverse outcomes following biventricular conversion with single ventricle palliation takedown. J Thorac Cardiovasc Surg 154: 572-582. Bacha E (2017) Borderline left ventricle: Trying to see the forest for the trees. J Thorac Cardiovasc Surg 154: 570-571. Delius RE (2017) 2-V or not 2-V: That is the question…plus some musings on thinking out of the box. J Thorac Cardiovasc Surg 154: 583-584. Buratto E, Khooa B, TaoYea X, Konstantinova IE (2018) Does biventricular conversion bring survival benefits to patients with an unbalanced atrioventricular septal defect? Eur J Cardiothorac Surg 53: 1295. Buratto E, Tao Ye X, King G, Shi WY, Weintraub RG, et al. (2017) Long-term outcomes of single-ventricle palliation for unbalanced atrioventricular septal defects: Fontan survivors do better than previously thought. J Thorac Cardiovasc Surg 153: 430-438. Watts R, Vyas H (2013) An overview of respiratory problems in children with Down’s syndrome. Arch Dis Child 98: 812-817. Colquitt JL, Morris SA, Denfield SW, Fraser CD, Wang Y, et al. (2016) Survival in Children With Down Syndrome Undergoing Single-Ventricle Palliation Ann Thorac Surg 101: 1834-41. Polimenakos AC, Subramanian S, ElZein C, Ilbawi MN (2017) Attrition in patients with single ventricle and trisomy 21: outcomes after a total cavopulmonary connection. Interactive CardioVascular and Thoracic Surgery 24: 747-754. Hoashi T, Hirahara N, Murakami A, Hirata Y, Ichikawa H, et al. (2018) Current surgical outcomes of congenital heart surgery for patients with Down syndrome in Japan. Circ J 82: 403-408. Ooi YK, Sinha P, Gierdalski M, Ashraf Harahsheh A (2015) High-risk single ventricle palliation in children with Down syndrome: single institution experience. Cardiology in the Young 25: 539-543. Wada N, Takahashi Y, Ando M, Park I-S, Sasaki T, et al. (2008) Single ventricle repair in children with Down’s syndrome. Gen Thorac Cardiovasc Surg 56: 104-108. Irving CA, Chaudhari MP (2011) Cardiovascular abnormalities in Down’s syndrome: spectrum, management and survival over 22 year Arch Dis Child 97: 326-330. Knecht KR, Bryant J, Garcia X, Pye S, Prodhan P, et al. Heart Transplantation in the Short Term After Chemotherapy. J Pediatr Hematol Oncol 37: 409-410. Broda CR, Cabrera AG, Rossano JW, Jefferies JL, Towbin JA, et al. (2018) Cardiac transplantation in children with Down syndrome, Turner syndrome, and other chromosomal anomalies: A multi-institutional outcomes analysis. J Heart Lung Transplant 37: 749-754. Bergström S, Carr H, Petersson G, Stephansson O, Bonamy AKE, et al. (2016) Trends in congenital heart defects in infants with Down Syndrome. Pediatrics 138: e20160123. Lytzen R, Vejstrup V, Bjerre J, Petersen P, Leenskjold S, et al. (2018) Live-born major congenital heart diisease in Denmark. Incidence, detection rate, and termination of pregnancy rate from 1996 to 2013. JAMA Cardiol 3: 829-837.